For the ninth year running, Christophe Ribot of Miami Kiteboarding, Neil Hutchinson of Slingshot Kiteboarding brought this great event to Crandon Park in Miami once again. When the wind is on this is an incredibly scenic venue both for riders and spectators. The wind gods delivered this year with a few lulls and the riders had a blast! Be sure to checkout images from the past kiting events at Crandon Park HERE and HERE. There was an exceptional turnout possibly the largest since this event started. Things kicked off with a course race which sadly I missed. Easter weekend and family commitments, what can I say? Fortunately, I was able to shoot most of the afternoon action which follows. Christophe, Neil, Morgan and Juan, judges from The Kiteshop organize and watch the action. Neil and Garry hold the captains meeting for the afternoon free style session. Ugne of Miami Kiteboarding and sporting a stylin Roxy wetsuit gets ready to ride. Lots of kites and among it all is new Cabrinha team member, Annabel van Westerop. She hails from Aruba and is both a strong and skilled kiter. Damien Leroy, Cabrinha team rider and World Champion Slalom kiter is present as always riding very well and having a great time too. Garry and Alexandra Menk get ready for the event, Alex as a competitor and Garry bringing the event about behind the scenes. Garry along with Ken Russell are national distributers for Jimmy Lewis boards. Matt Collins (I think) passes one near shore. Say, if I mess up anyone's name or leave someone out please send me a message. Thanks! Alex throws a donkey kick or I think that is what Neil called it. The wind was light for portions of the free style event with things going on weather hold a few times. Alex is working it as best as the lighter conditions allowed. She is quite a talent under a kite. Things became so light during this one heat that Damo invented this kiting easy chair to gain some style points. There wasn't enough wind to even get off the water at this point. Checkout the wind plot from Crandon that day. I was there from about 1 pm and on. You can figure out the wind hold times. Patrick sports a GoPro on an improvised monopod, (a windsurfing mast!) as Johnny Berger flys by. 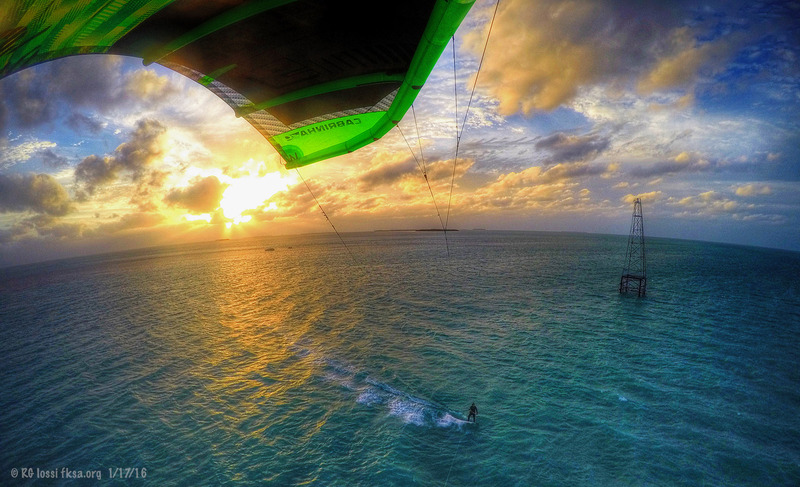 Giovanni or Gio Messina with Miami Kiteboarding shows his stuff aloft. Alex works back upwind. Lots of competitors had to beat it fast back upwind on foot during the lighter periods. Rich Gardener and Andre Balzac go to it. Rich has been a hard riding standard at events all over for years. Andre at 14 years is fairly new on the kiting scene but riding very well. Sprinting back upwind for all he is worth, good competitive spirit while Ms. Ribot captures the action! Brandon Bowe is a strong up and coming Cabrinha rider from the west coast. He rode very well in this contest. A Miami Kiteboarding instructor sets up for a lesson off the sand bar as a mega cruise ship eases out of Government Cut to sea. Big Ian throws one in boots. A heavier guy like Ian needs a bit of wind to compete, who doesn't, looking good here though. Patrick Rynne carves a smooth turn on his homemade traditional Hawaii wood board sans fins during one of the wind holds in the competition. The board flexes on turns aiding in the carving. He is working on a documentary on how to make these remarkable boards in short order. He later broke it this day but no worries he had it repaired the next day? Fast work and a novel board thanks to Hawaiian insight and wood glue. Patrick's girlfriend goes out for a whirl. Despite lighter winds she rode upwind fast and easily. I think I need to look into making one of these boards once the "how to" video comes out. Damo and Annabel experiment with a QuikPod Monopod. I understand this monopod works both in air and seawater. Some of us are trying it out currently for kiting, diving, whatever else comes to mind. It can be used with a variety of cameras including the GoPro shown here. Here we are in a group shot taken with a GoPro HD and the monopod. Damo following instructions, goes up! Fortunately, lighter winds didn't prevail for the entire day. Near the end, some lighter squall lines passed to the north and south of Key Biscayne bringing a nice pressure gradient and WIND! The folks ate it up and an impromptu big air contest was called. I took some artistic license Photoshopping some of these images. The squalls were no where near as black or menacing as shown. Plus they were pretty far off too fortunately. Brandon does a board off against a dramatic ('shopped) sky. Some of the Cab riders started charging around boosting synchronized jumps. Looking good! Five go up at once. Just add wind and a bit of skill and you're way up there! Another dramatic image somewhat exaggerated by Photoshopping. Still looks interesting! We had a solid 20kt consistant toward the end of the day, and the Big air contest was a amazing Show. Special Mention to Damien's Cabrinha team riders, who put up a breathtaking spectacle in jumping together: a real aerial choregraphy !" Christophe congratulates 14 year old Andre Basic for some excellent kiting. Christophe awards Bertrand Lecoq for the number one senior riding spot. See you from the 2012 Kiteboard Masters, hope to bring back a new batch of kiting images same place, same time next year! Last edited by RickI; 04-18-2012 at 10:11 AM.